We are proud to offer the brand new plugin Bitmap2Material on our website. With Bitmap2Material it's possible to convert any photo, texture or bitmap into a seamless tileable material and use it directly in 3D Studio Max, Maya or even in realtime with Unity 3D. It also generates normal maps, displacement maps, specular maps and ambient occlusion maps on the fly. Nearly endless possibilities for your 3D renderings! 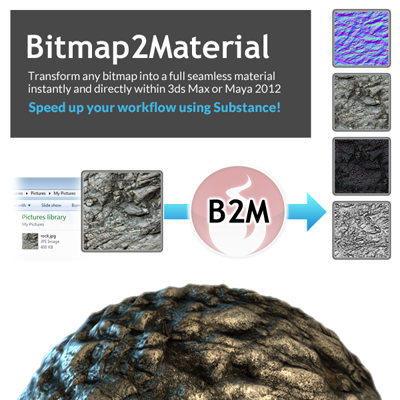 You get more information on our Bitmap2Material product page or directly on www.allegorithmic.com.